Our white stucco beach house is virtually surrounded by the 72 degree warm waters of Nantucket Sound, Little Pond and Great Bay. 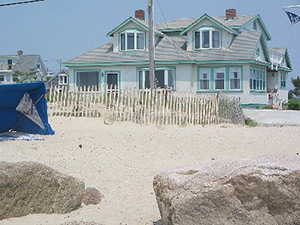 The house has been owned by the Regan Family for over 30 years and was operated as the Seashell Inn until the summer of 2012. Today they still reside in their owners unit and also rent on a weekly basis only. The rental unit is 5 bedrooms with a spacious kitchen, living, dining area. It sits on almost one-half acre landscaped lawn area with lawn furniture, picnic tables, and cookout equipment for your enjoyment. We are wireless-internet capable for your convenience. parking or beach fees to contend with. Adjacent town conservation land provides a green necklace along the shore of Great Bay for your walking enjoyment. The path's beauty is accentuated in early summer by the colorful rosa rugosa, rambling roses, sweet pea and wildflowers. 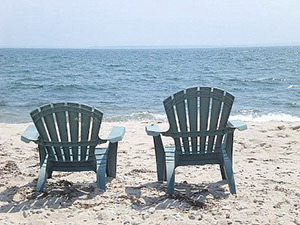 and boats to Martha's Vineyard island are within 2 miles.